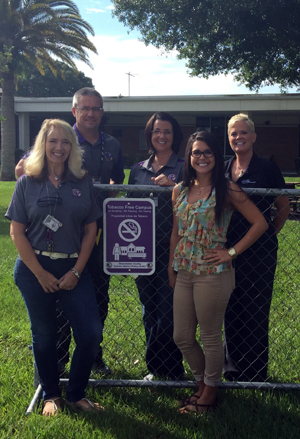 Okeechobee, FL — On Friday September 11, 2015, The Tobacco Free Partnership of Okeechobee County presented the school district with 27 new district approved tobacco-free signs. These new signs promote the School District’s revision of the tobacco free policy that became effective July 1, 2015. The new policy prohibits students, employees, parents, volunteers, and visitors from using tobacco products of any kind on any School District properties, in district vehicles, and at district or school sponsored events. Prohibited tobacco products include chewing tobacco, synthetic tobacco products, and electronic cigarettes/cigars. Pictured: Back Row from Left to Right: Dylan Tedders Principal at Okeechobee High School, Lauren Myers, Vice Principal, Courtney Moyett, Community Health Advocate for QuitDoc FoundationTobacco; Front Row from Left to Right: Sherry Wise Vice Principal, Jasmine Moyett President of SWAT (Students Working Against Tobacco) Club at OHS. The Tobacco Free Partnership of Okeechobee is committed to keeping Okeechobee youth tobacco free, and the new School District policy will have a tremendously positive impact. Increasing tobacco-free social norms on school campuses is a critical component in ensuring that students remain tobacco free. Research shows that students who witness tobacco use on or near school campuses are more likely to view tobacco use as a normalized behavior, increasing their chances to begin using tobacco products. The Tobacco Free Partnership of Okeechobee County is dedicated to the creation of tobacco-free social norms through a combination of community education, youth advocacy, and changes in local tobacco policies. The mission of the Tobacco Free Partnership of Okeechobee County reflects the goals of the CDC Best Practices, especially in regards to changes in local tobacco policies to create and promote tobacco-free social norms. 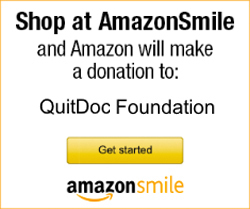 To learn more about the partnership or to get involved, visit www.TFP-Okeechobee.org.